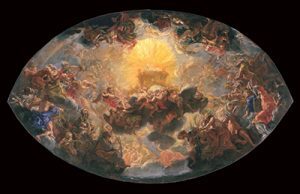 Bellarmine Hall Galleries at the Fairfield University Art Museum will host the exhibit “The Holy Name: Art of the Gesù: Bernini and his Age.” The loan exhibition runs from February 1 until May 19. According to the museum, the exhibit assembled “together for the first time an important group of dazzling and historically important works of art to tell the twin stories of the rise of the Society of Jesus in Rome and the building and embellishment of the Gesù, its glorious mother church, in the very center of the city.” The loan includes materials from the Gesù, including Bernini’s bust of Bellarmine, as well items from private collections. More information is available at the museum’s website, https://www.fairfield.edu/museum/.